We are leaving for Rome in 4 days... holy meatballs! Whenever anyone asks me what I'm most excited for, my mind automatically jumps to one thing. No, it's not the romantic architecture that I’ve been studying for years or the fact that I won't be working for 2 weeks. It's not even the pizza or all the tiramisu I'm going to consume on a daily basis. It's the to-go pasta! lolololol I've mentioned it before, but I have a strange love for eating and walking. I love it so much that I've seriously thought about turning this combo into an Olympic sport where the athletes wear all white bodysuits and eat wet burritos or piping hot bowls of beef pho while also speed walking 1600 meters. Why do they have to wear white body suits? Because each athlete would get points deducted or more time added based on the amount of spills they get! hahahaha I giggle at this idea every time and feel slightly embarrassed I've spent enough time figuring out all the random details. The sport still needs a name though! Anyways, to-go pasta is literally the thing I'm looking forward to the most on this vacation. My friend Kelsey told me about this concept when she was studying abroad in Florence. What I’m imagining is a Chinese food take out container filled with the best pasta I’ve ever had. I’m so ready! Do you believe me now that I love portable food?? Foods on sticks. Self contained bundles of food like buns or onigiri. Anything that's smartly packaged in a neat and easy to eat out of container. A part of me thinks that if I'm eating and walking at the same time I'm also burning calories, which means I can eat more... honestly the logic isn't tooooooooooo crazy. Plus any food is portable if you tried hard enough... hence the Olympic sport! I don’t advise you to try eating hot pho while speed walking unless you’re a pro. 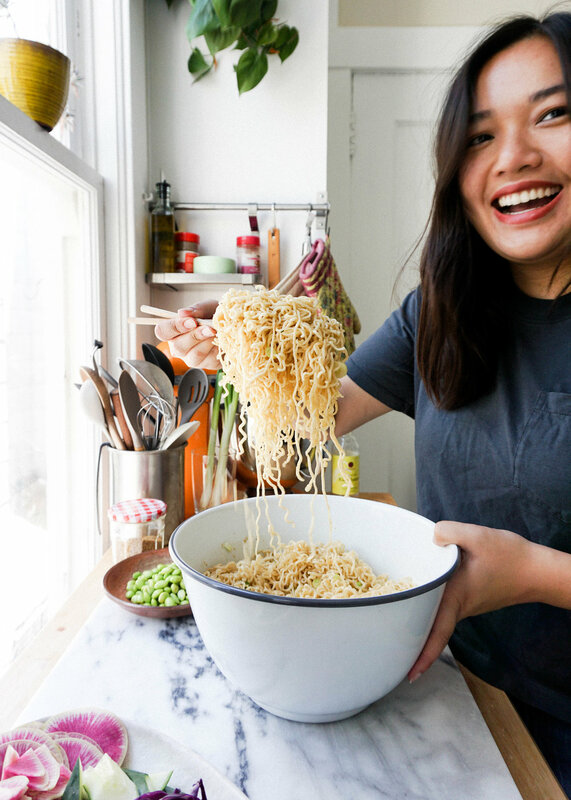 You know what's even better than portable noodles though? Not much... but portable dessert!! Obviously ice cream cones and ice cream sandwiches are the classic portable desserts, but doesn't portable cake sound like a dream come true? Especially a cake that's been soaked in milk tea and covered with whip cream! The inspiration for these Milk Tea Tres Leches came from a little market over by Reuben's office. I went there for the first time and was overwhelmed by how beautiful the prepackaged foods were! Like a million times better than the Trader Joe's grab and go lunch cold case I'm always frequenting at lunch. My eyes lit up when I saw their grab and go dessert section. Rows and rows and rows of weck jars filled with fruit cobbler, mousse, and cake!!! I had to grab a jar of their tres leche because there's something so satisfying about the texture of sponge cake soaked in cream. Mmmmmmm. It was SO GOOD. I beg Reuben every few weeks to bring me home one so we could split it for dessert! This version has a little Hong Kong Milk Tea Twist! Milk tea is traditionally made by brewing ceylon tea (or red tea) and mixing in condensed milk and evaporated milk for a sweet and smooth finish. It's one of my favorite drinks and I'm always thinking of ways to incorporate it into desserts! It only seemed natural to infuse the ceylon tea into the tres leche since all the dairy was already there! The light and fluffy vanilla sponge cake is soaked in a tres leche mixture of condensed milk, regular milk, and heavy cream that's been steeped with ceylon tea. The resulting texture is light but also custardy. What dreams are made of! You can either assemble the tres leche in little parfaits like me or as a whole cake to share with friends or horde for yourself. I'll never judge! Talk you soon, friends! Next time you hear from me, I'll be in the land of carbs and portable pasta! Tune into my Instagram stories and watch me roam around Rome with a tub of chewy noodles and red sauce stains on my shirt! It's going to be glorious! Preheat oven to 350 degrees. Grease and line a 8”x8” baking pan with parchment paper. In a large bowl whisk together flour, baking powder, and salt. In a medium bowl whisk together egg yolks and sugar for 3 minutes until thick and pasty. Fold yolk mixture into the flour mixture. In a clean bowl beat egg whites until you have stiff peaks, about 5 minutes. Gently fold egg whites into the flour mixture until evenly combined. Pour cake batter into the baking pan. Use an offset spatula to smooth the batter evenly in the pan. Bake for 20-24 minutes. Test for doneness using the toothpick test. Allow cake to cool in the pan for 5 minutes and then remove from the pan to cool completely on a wire rack. While the cake is baking, bring 1 1/2 cup heaving cream and ceylon tea to a gentle boil. Boil for 5 minutes. Watch carefully so it doesn’t overflow! Remove the cream from the heat and allow the tea to steep for 30 minutes. Discard tea bags and mix in condensed milk and regular milk. To make whipped cream, whip heavy cream with powdered sugar until fluffy. To assemble the parfaits, cut out 2.5”-3” cake rounds with a biscuit cutter. You should be able to get 6 full cake rounds for 3 parfaits and use the cake scrapes for the 4th parfait. Poke a few holes into the cake rounds using a fork. Place 1 cake round in a glass jar or serving glass. Pour 2-3 tbsp of the milk tea cream mixture. Add 2-3tbsp of whipped cream. Repeat cake, milk tea, and whipped cream layer again until filled. Place tres leches in the fridge for at least 3 hours to allow the cake to absorb the milk tea. They can be stored in the fridge for up to 4 days. When ready to served dust with a little cocoa powder! Hello from Chicago! Well, by the time you read this I will be a zombie trying to make it through the day in San Francisco. I'm currently incredibly full from dinner, curled up in my hotel bed and watching TLC. It's awesome. I'm in Chicago for a couple days for work, so I've been spending my days in a stuffy construction site getting all dusty and punching things. I'm not literally punching things! One of the very last steps of an architecture/interior design project is completing the punch walk, which is when you walk through the entire project noting every little and big thing that needs to be fixed or adjusted. Punching! It's sort of fun but also really exhausting. I would equate it to museum exhaustion. You know, that mental and physical tiredness from slowly sauntering and reading every artist placard. After a day of punching, we headed over to Avec for dinner and it was amazing! They had this avocado and sweet potato salad with a garlic dressing and za'atar that I need to recreate the second I'm finally home for an extended period of time and can actually cook again! Gosh, I miss my tiny zero counter space kitchen. I miss making myself matchas in the morning, spending too much time fixing myself a pretty bowl of yogurt, and VEGETABLES. Gosh, I need vegetables. I was also in Cleveland this weekend for some quality family time, which is typically a marathon eating session. So I'm just v v v v v full and am in desperate need of vegetables. Despite the constant discomfort of being full, I do love trying all these new dishes from eating out and getting inspired to create new things in my own kitchen. The notepad in my phone that lists all my random recipe ideas is getting real good and real exciting. These Strawberry Basil Donuts are actually inspired by the Blueberry Basil Bourdon Donuts from Blue Star Donuts in Portland. They are one of the many things I ate in Portland and said to myself, "oh man, I gotta steal this idea!" 😛 I loved the natural sweetness and tartness from the berries and the herbaceousness (that's a word I think) from the basil. It was a flavor combo I don't encounter often in the dessert world. Instead of blueberries I used strawberries because it's strawberry season in California and the the farmer's market is bursting with them! The strawberries also make a really lovely pale pink glaze that I feel like is very on trend right now if color trends are your thing. I'm also participating in my very first internet food blogger party thing! A bunch of other fellow food bloggers created incredible strawberry inspired recipes! If you're interested in checking them out, here are the links to them all below! Also check out #strawberriesarethejam for some drool worthy content! 1. Combine yeast, warm water, a pinch of sugar in a small bowl until yeast is dissolved. Allow to sit for 5 minutes to allow the yeast to activate. You should start to see small bubbles on the surface. 2. In the bowl of your standmixer fitted with a dough hook, combine flour, sugar, and salt. Add in yeast mixture, eggs, and oil. Stir the dough on medium low speed for 7 minutes until smooth. 3. Place dough in a greased bowl, cover with a damp kitchen towel and allow to proof in a warm place for 2 hours. 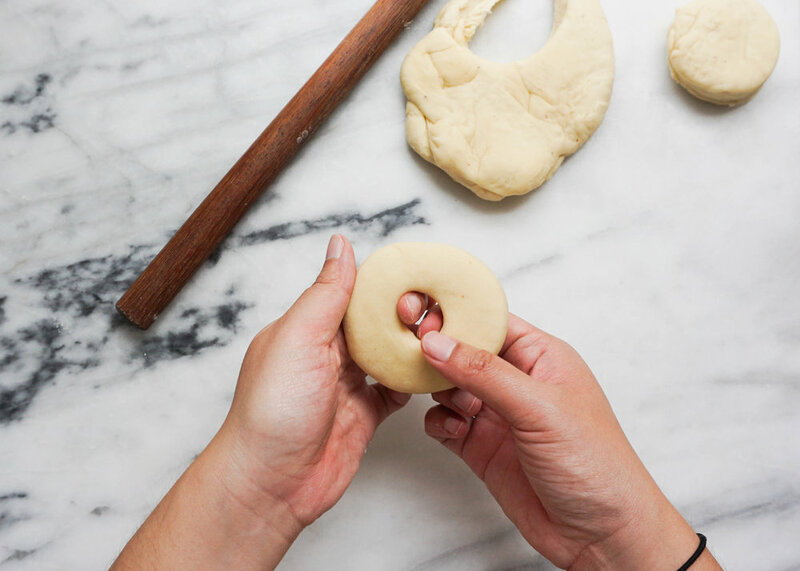 After proofing, roll out the dough on a lightly floured surface until it is 1/2" thick use a 2.5" to 3" diameter biscuit cutter to cut our your donuts. Re-roll your dough scrapes to make additional donuts. Use your index finger to gently press a hole out of the center. Pull the whole part with your hands to stretch out the donut. Place on a parchment paper lines baking tray. Repeat with remaining donuts. Cover with a damp kitchen towel and allow to proof for another 30 minutes. 4. Fill a heavy bottom pot with vegetable oil. I used about 5 cups of oil for my dutch oven. Heat over medium high heat until it reaches 350 degrees. If you don't have a thermometer you can test the oil with a scrap of dough. It should sizzle immediately, brown gradually, and not cook too fast. If it browns too fast the oil is too hot. Fry your donuts in batches for 1 to 2 minutes on each side. Remove them from the oil with a slotted spoon and place them on a wire rack to cool. 5. To prepare your glaze, puree strawberries and basil in a food processor or immersion blender until smooth. Place in a small pot or sauce pan and heat over medium heat for 5 minutes until it has reduced. Place strawberry basil reduction in a small bowl and allow to cool. Gradually mix in confectioner's sugar until smooth. Whisk in milk. Add a little more sugar or milk to reach desired consistency. 6. Dunk a cooled donut into the glaze and allow the glaze to set on a wire rack. Repeat with remaining donuts. Isn’t Autumn when things are supposed to calm and slow down? Lies. This month is going by way too fast. It’s going to be Thanksgiving next week and we have ZERO plans. This what will most likely happen: Reuben and I will make a Thanksgiving feast for two, catch up on sleep, and work on some long overdue apartment improvement projects. It makes me sort of sad when I think about how I haven’t been home for Thanksgiving in like 4 years... : ( ... but that just makes being home for Christmas that much sweeter! This will be our first year in SF for Thanksgiving in a while, so it will be nice to stay put. Last year we were on the road to Portland and had leftovers at the Airbnb. The year before that, we were driving through Spain and stopped at a gas station between Madrid and Granada for some ham sandwiches, LOL, but this was our view, and Spanish gas station food is actually pretty awesome. What are your plans? Are you going to make a pie? Or are you more of a cake person, like me? I had ambitions of trying my hand at my first full blown pie this weekend. I was going to do braids, intricate weaving, and maybe even cut out letters! But plans changed and I made pork buns instead. No regrets. Because they were incredible and I am going to post the recipe soon! I’ll save my Asian pear and caramel pie experiments for next year. 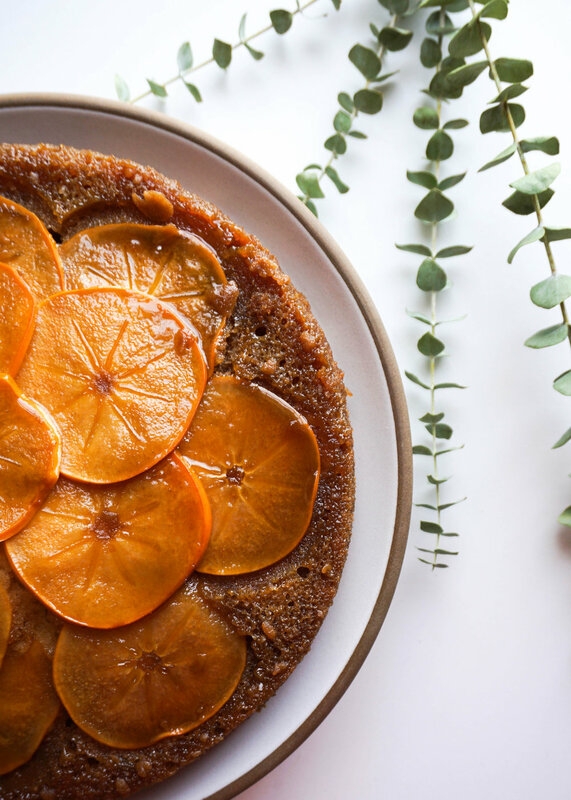 I do have this Persimmon Upside Down Cake for ya though! It’s so delicious. You don’t need pie. Some people ask me what I do with all the baked goods I make for the blog. When I say “some people” I really mean 3 people have ever asked me that question. My baking experiments are typically brought in to my office or to Reuben’s office to be gobbled up. Or, I plan ahead and bake something to bring to a dinner party or picnic. I try not to leave us alone with too much butter and sugar. However, every once in a while there are the baking experiments that I do not share. Not because they were complete failures, but maybe because they were too freaking delicious to share. 1. Preheat the oven to 350 degrees. Line the bottom of a 9" round cake pan with a piece of parchment paper and grease the sides of the pan. Set aside. 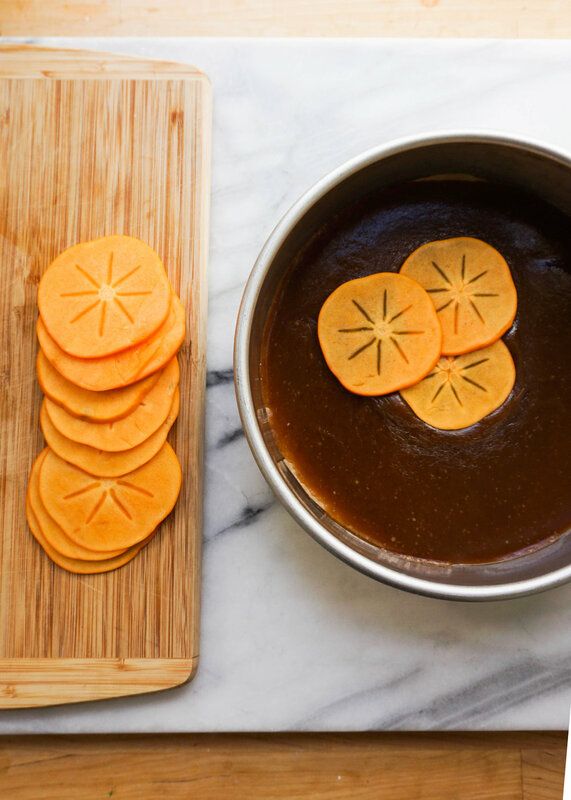 Cook brown sugar, butter and salt in a small sauce pan over medium high heat. Whisk until butter is melted and all the sugar is dissolved. Gently boil for 3-4 minutes until deeply brown. Pour the caramel into the cake pan and swirl so that the pan is completely and evenly covered. The caramel will harden quickly. 2. Slice the persimmons into 1/8" thick slices. Place a slice in the very center of the caramel and continue adding slices in a circular direction until the bottom is covered. 3. Whisk flour, sugar, baking powder, baking soda, salt, and spices in a large bowl. Whisk together eggs, buttermilk, and butter in a separate bowl. Add wet ingredients into the dry and mix until evenly incorporated and you have a smooth batter. Pour the batter into the cake pan. Use an small offset spatula or the back of a spoon to spread and level the batter. 4. Bake for 45-50 minutes. Test for doneness with a toothpick. Allow to cool in the pan for 20 minutes. Invert the pan onto a wire rack set on top of a baking tray and allow to completely cool. Watch out for some caramel dripping when you invert! 5. Serve up and enjoy! recipe was adapted from this and this!